Hey guys. So. The blog was infiltrated by spam for a few months. This is a post I drafted back in March, but could not post, due to the virus drama. I added some commentary from the future to it. Enjoy. Every once in awhile, I like to review something classic. Old news, but nonetheless awesome. This is especially common when I am on a reading block, and haven’t read anything new in a while [Or when I’m just too lazy to read anything new]. Like, right now. 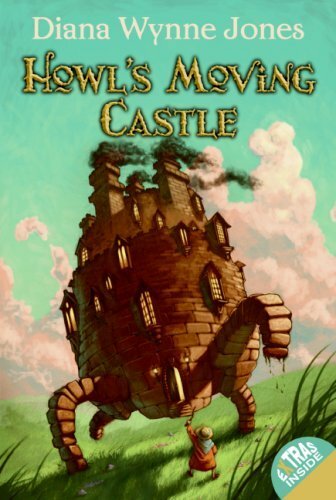 I am currently on a read through of Diana Wynne Jones’ Howl’s Moving Castle series (aka, my favorite (second only to Peter Pan [Past Maddie was super hyped up when she wrote this])). A fantasy series of the 80s, this book is very neglected, unlike it’s film counterpart by Hayao Miyazaki (founder of Studio Ghibli). While the film is also one of my favorites, it is very different from its literature equivalent. Sophie Hatter is, basically, me. The oldest of three siblings, kind of a pushover, the one who seems destined for a boring life [Seriously. She is literally me. LITERALLY. I mean, has anyone ever seen me and Sophie in a room together? I think not]. She is very, very much not the stereotypical heroine. In fact, although she does end up (helping) to save the day, she doesn’t end up having some special ability that makes her the savior. She does indeed end up having magical abilities, but it barely mentioned throughout the novel. Truly, Sophie’s plot is about her personal growth, which is what I find very fascinating. Jones it one of my favorite authors. She simultaneously makes fun of fantasy clichés, all the while using them (and making them work) in her novels. She has a quick witted, sarcastic tone throughout her writing, which is truly a joy to read. A great companion to her novels (or really, just a great book in general to read for a laugh) is The Tough Guide to Fantasyland. This book is a bit hard to come by (they just started printing it again recently) but is definitely worth the search. It is written as a guide book to the cliché fantasy novel. It serves as great satire, as well as a good guide to writing fantasy fiction. If you are a fan of fantasy novels, or comedic writing style, please check out Jones’ work. Once you’ve read the book (or before, your choice bro) check out Studio Ghibli’s adaptation of Howl. Before her passing, Jones was a big fan of the film, despite the many changes. It is a prime example of how a book-to-movie adaptation can be great (even better [Wow past Maddie. That’s a bit extreme.]) with changes made to the plot, for the sake of the new platform.